Cillian joined the staff of the Red Ribbon Project in July 2012. He has day to day responsibility for our accounts and administration including Reception, Room Rental, Social Media/Website content, Marketing & Public Relations as well as managing the Drop In Service and is usually the first person you meet when you enter reception. 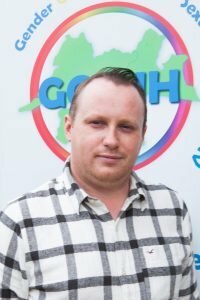 Cillian is also is the Volunteer Coordinator for GOSHH, if you are interested in volunteering with us then please complete our volunteer application form which is available here. Cillian represents GOSHH on a number of committees including the National Sexual Health Communications Working Group, Limerick City & County Council SPC for Community, Leisure & Emergancy Services and the Limerick City & County Council Suicide Prevention Working Group. Cillian holds a qualification in Non-Profit Management and Leadership, as well as a Certificate in Television & Video Production and a Diploma in Marketing, Advertising, & Public Relations.